I don’t think October is too early to be thinking about Christmas gifts. To be honest, I shop for presents for Christmas, birthdays. etc year round when I see something I look for a really good price. But once fall hits, I start thinking about those presents I will be making for others and begin creating so that I have enough time to get my projects completed. So, I thought that for the next couple months I would share how to make some of the gifts I will be giving away this holiday season here on Northern Cheapskate and on Save Green Being Green. 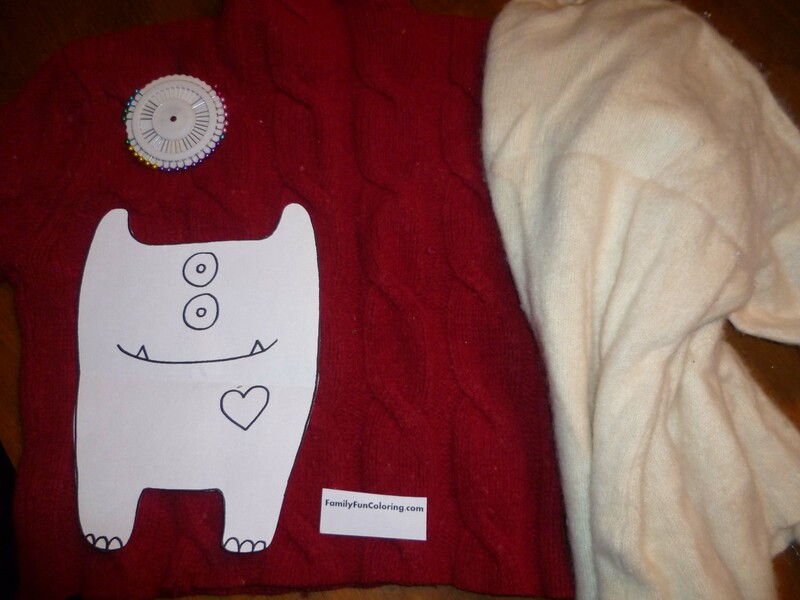 The first tutorial I am going to share with you is how to make Monster Stuffies by up-cycling old sweaters. I took out a 100% wool and a 100% cashmere sweater from my “Clothes to Recycle” Box in order to make a stuffie for each one of my children. You might recognize the red wool sweater as one I used to make my daughter a recycled sweater dress with last Christmas. I also printed off a free monster coloring sheet to use as my template. To start with I will pin the template through both sides of the sweater and cut 1/2″ outside of the template to allow room to create a seam. To make the facial features on the monsters I cut out the pieces from the template (for one monster) and drew features on a piece of paper to use for the other monster. 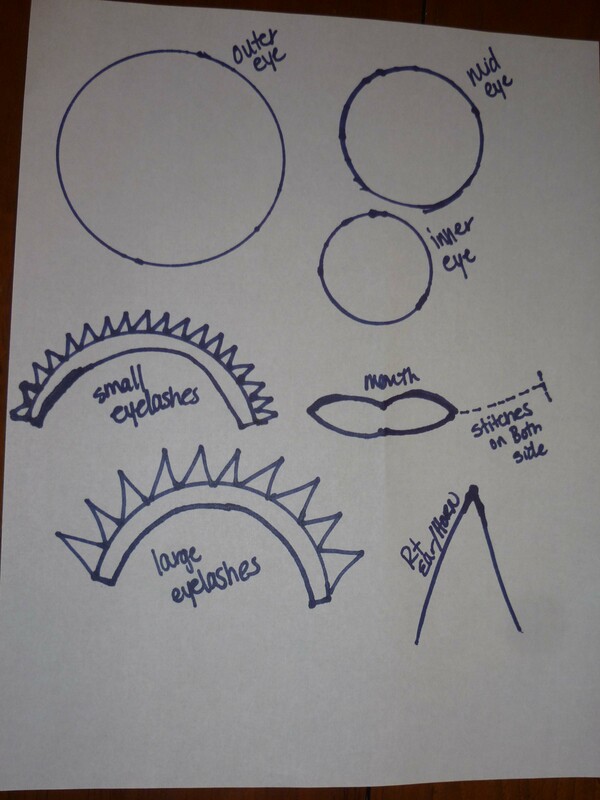 The facial feature paper pieces will be pinned to felt (all leftover pieces from other projects, but can easily be purchased for about 30-cents a piece at a fabric or craft store. 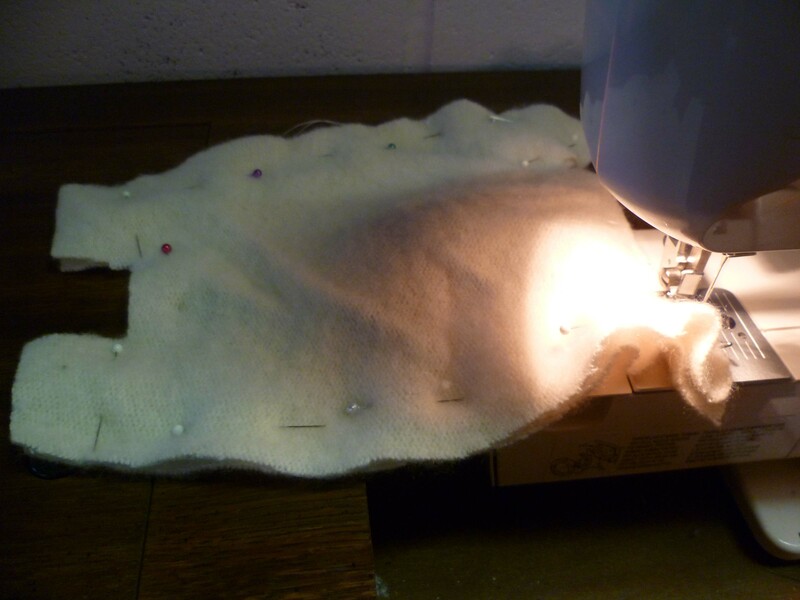 It is easiest if you hand stitch the features to the front piece of fabric before stitching the front & back together. I used DMC floss (again, leftover from other projects) to stitch the facial features on. Buttons are fun to use if you have some neat or colorful ones in your craft kit. Also, I machine stitched the yarn (leftover from the winter hats I made them for another Christmas present) on the of the front before assembling. Remember to have the yarn facing down and on the front so that when you close your seam the stitching does not show and your yarn faces upwards. To finish assembling your stuffie, face the right sides together with a 1/2″ seam. Be sure to leave an opening of about 2″ so that you turn your stuffie right side out and fill it with stuffing. I left my opening at the top of the head where the yarn is. The yarn helps hide the hand stitched seam. You could try to machine stitch the seam, but I found it easier once it is stuffed to handstitch the last 2″. The stuffing was the only thing I had to purchase for this project, although you could re-use stuffing from an old stuffie or pillow that would be destined for a landfill. The stuffing I bought was from ArtScraps, which is a wonderful little art supply store in St. Paul, MN that sells a variety of items to be used for art & craft projects that might otherwise ended up in a landfill. You never know what you will find there, so it takes an open mind and an imagination to shop here. And here they are! The finished products! I can’t get over how adorable they turned out. 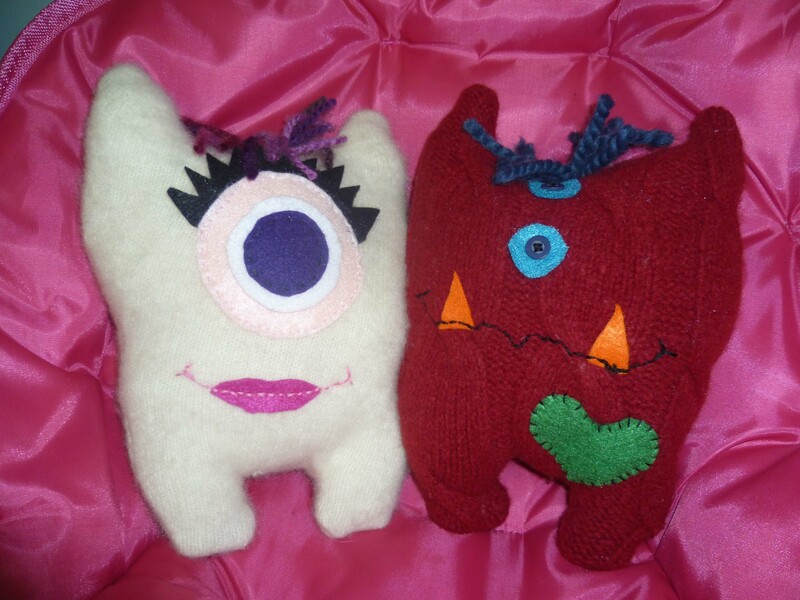 I hope you like them and maybe they have inspired you to make some monsters of your own for your little monsters. These are awesome! I have to see if I can do this with my kids. I think they would love these little guys.